There’s a conspiracy going on in TV at the moment. Or at least some sort of coincidence. There seems to be quite a few actresses knocking around that look rather like Megan Fox. Ok, well, two that have caught my eye lately. In both cases, you don’t have to agree with me that the resemblance is more than a passing one, but let’s just say that they’re both stunningly gorgeous brunettes and leave it at that, shall we? 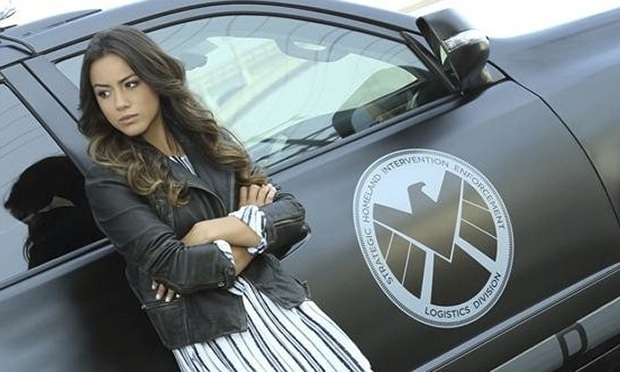 Chloe Bennet – Skye, Marvel Agents of S.H.I.E.L.D. Born Chloe Wang in 1992 in Chicago to a Chinese father and American mother, she moved to Beijing at an early age to pursue a pop career. So… landing the role in Agents of S.H.I.E.L.D. represents, by far, her biggest gig to date. Clever casting by the show’s creators too, as she plays a very Joss Whedon-esque character. Consider this: If this show is the natural evolution of Buffy the Vampire Slayer, then Bennet as hacker activist Skye (recruited into S.H.I.E.L.D. early on) seems very much in the Buffy mould. Smart, sassy, and achingly beautiful. SPOILER ALERT: if you’re still watching season 1 the clip below should be avoided. Newcomer to season 2 of this show, Stroup – best known for her role in Beverly Hills 90210 – is the niece to Kevin Bacon’s dogged protagonist Ryan Hardy. She plays a New York detective who, in order to become closer to her uncle, helps him chase down factions of serial killer Joe Carroll’s (James Purefoy) cult early in the season. With her piercing blue eyes and gorgeous looks, she’s a welcome addition to the show. Her character Max also humanises Ryan Hardy, giving him someone to care for as they both chase down the killers as a niece-uncle combo. Maybe it’s me, but I don’t think either of them look much like Megan Fox other than being brunette. The only one I’ve seen who I really think resembles her is Odette Yustman. On the other hand, I think there are a slew of actresses and entertainers who look so much alike I think they’re clones: Zoey Deschanel, Emily Blunt, Katy Perry, Mia Kirshner, etc. Odette Yustman is a good call. Although she then puts me in mind of Olivia Munn and Olivia Wilde. Personally, I’m happy they’re all on screen. They’re all stunning.